Napa students rallied for climate change action on March 15. 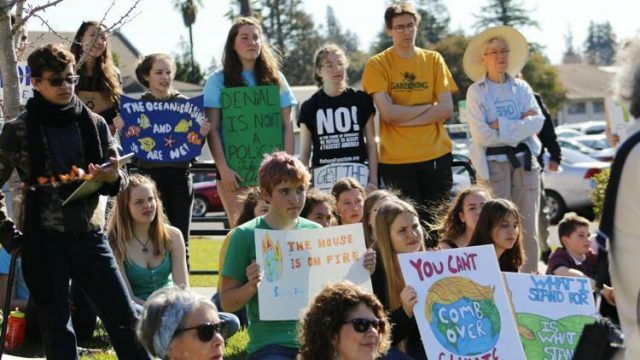 The event was featured in the Napa Register article Climate Matters: Youth Speak out on Climate Change by reporter Chris Benz in the April 7, 2019 issue. "Shira Sadeh, 17, and Bailey Thompson, 18, both students at the Oxbow School, were the principal organizers of Napa’s student rally. They learned about climate change through Oxbow’s Environmental Science class taught by Alex Keilty. The Oxbow Teaching Fellow is a one-year position for recent college graduates interested in pursuing a career in teaching or working with adolescents in a residential environment. The Teaching Fellow’s principal responsibilities lie in two areas: program and residential life. On the program side, the Teaching Fellow works closely with an art or academic faculty mentor and builds toward designing and leading a project. Residentially, the Teaching Fellow lives in the dorms to assist the Dorm Heads in organizing community life activities and being an additional adult presence on campus for student life issues that may arise. The person who best fits this role is someone who is mature, has strong interpersonal skills, is genuinely invested in the welfare of adolescents, and possesses an infectious enthusiasm for the Oxbow School program. Further, this person will engage and model Oxbow’s learner expectations: creative and critical inquiry, effective communication, self-empowered learning, a collaborative mindset, and responsible citizenship. There are no 2019 Summer Camp positions open at this time. Caroline Woolard was selected by Moore College of Art & Design as the first recipient of the Jane and David Walentas Endowed Fellowship. The prestigious annual fellowship underscores Moore’s ongoing commitment to social engagement by offering opportunities to thoughtful artists who bring their vision for the future of cultural production to the Moore community and the larger artistic community of Philadelphia. "As the Walentas Endowed Distinguished Fellow, Woolard will create sculptural objects for worker-owned businesses and self-organized groups, including a clock that relies upon water to mark intervals of time. Her project asks the questions: "Can an object interrupt the unavoidable antagonisms of working together? How do workers without bosses (i.e. worker-owners in cooperative businesses) transform workplace conflict?" 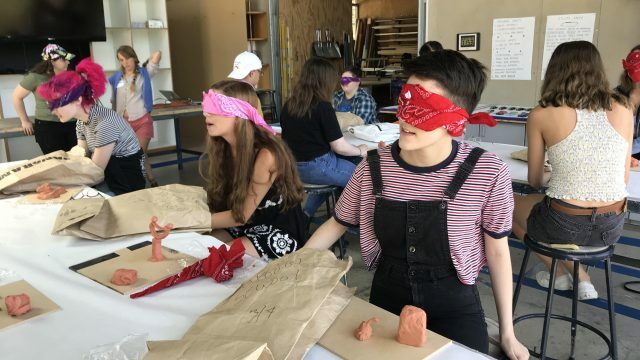 Woolard will make, with the support of Moore studio technicians, sculptural objects that are meant to act as tools to facilitate difficult conversations about structural and interpersonal inequity. These objects will migrate throughout Moore and become a central part of the Free Library’s new Robert and Eileen Kennedy Heim Center for Cultural and Civic Engagement, where they can be checked out to support the work of other community organizations around the city, including the U.S. Federation of Worker Cooperatives." Read full press release. Caroline has served on The Oxbow School Board of Trustees since July 2018. Chris Thorson's painted sculptures are currently included in two exhibitions: Feast & Famine a group exhibition that explores food as a social, political, and bodily phenomenon. The exhibition is on view through December 2019 at the Paul Robeson Galleries at Rutgers University Extension, Newark, NJ. 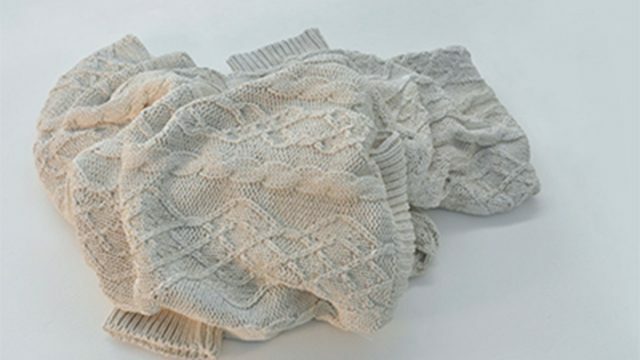 She is also included in Ordinary, an exhibition highlighting the ordinary through subject matter and use of materials. The antithesis of the spectacular, familiar objects bring art down to human scale and into the intimacy of daily life. The exhibition is on view through April 19 at 1337 Gallery, Artworks Downtown in San Rafael, CA. Chris is Oxbow's Dean of Arts Practice and Painting faculty. What's more exciting than a summer filled with inspiration, friends, and art making?! Give your teen the gift of Oxbow Summer Art Camp! Each day, campers mix studio time with participation in activities such as inspiration evenings, skit nights, campfires, yoga, outdoor films, and visits to Bay Area galleries. The first week, they will explore a variety of techniques and concepts in each of our studios. The second week, they will focus on creating a personal project. All levels of art experience are welcome! No portfolio required—just the desire to dive in and see what happens! Register Now! 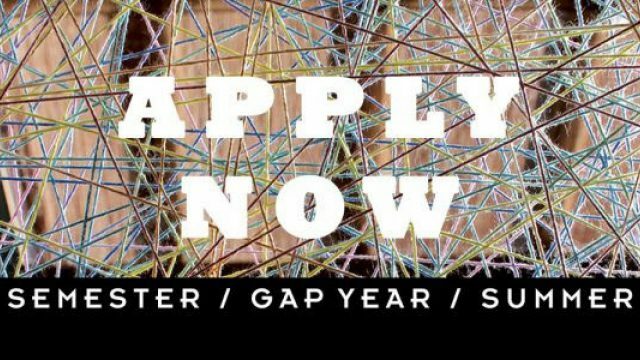 SESSION 1: June 23-July 8 | SESSION 2: July 14-29 | Rising 9th-12th Graders Painting | Drawing | Photography | Sculpture | Printmaking | Video | & More! 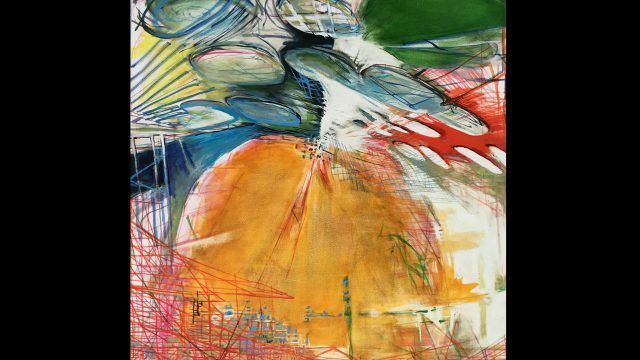 Artist Judith Belzer will be joining our faculty for Spring 2019 to work with students on projects. Judith Belzer is an artist who lives and works in Berkeley, California. Using primarily oil paint on canvas, she explores human engagement with the natural world, often looking to the man-made landscape in order to consider this dynamic and sometimes fraught relationship. 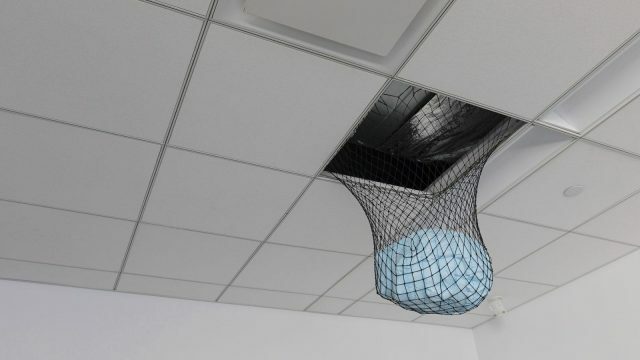 Artist Natan Daskal will be joining our faculty for Spring 2019 to work with students on projects. When does Life become Art? Natan's interest lies in the performance of everyday life and how the artist mind and creative experience can aid us in living better lives. Primarily an educator, Natan is Teacher-As-Artist, approaching the classroom/studio as a laboratory of living, co-creating experiences with students that aim to deepen awareness and to open new possibilities for personal and worldwide change. Admissions - It's Time to Apply! The Oxbow Admissions office is accepting applications for the Fall 2019 and Spring 2020 semesters. Interested applicants should try to complete all parts of their application in the next few weeks. Most students and their families hear about Oxbow from alumni. So Ox-bohemians, please spread the Ox-word to friends and neighbors. You can also help by setting up a presentation about your Oxbow experience at your high school! Alumni and parents, you can write Oxbow reviews to get the word out to other students and families at the following sites: Greatschools.org, Facebook, Private School Review, Teenlife. Or you can help by posting about your Oxbow experience on your blog, Instagram, and Facebook!